The natural gas pipeline giant remains extremely undervalued relative to its peers. Kinder Morgan's (NYSE:KMI) stock is down nearly 60% from its peak in 2015, yet the company's cash flow per share has only declined about 4% from its all-time high. This means shares of the natural gas pipeline giant are significantly undervalued right now, especially compared to its peers, suggesting that the stock has substantial upside potential. Kinder Morgan has been an early adopter of many of the trends currently dominating the energy midstream sector. The company was one of the first to roll up all its master limited partnerships into one simplified corporate structure when it made a headline-grabbing announcement in 2014 that it's folding all its public entities under one umbrella in a $70 billion deal. In the years since, rivals Targa Resources, ONEOK, Williams Companies, and Enbridge have announced deals to consolidate into simplified single corporate entities. In late 2015, Kinder Morgan was one of the early leaders in the shift away from the operating model of distributing all its cash flow to investors to a more sustainable one that balances cash returns to shareholders while internally financing a significant portion of growth-focused investments. Shares currently trade at less than nine times free cash flow. That's at the bottom of Kinder Morgan's peer group, where the average pipeline stock trades at 12.5 times free cash flow. That valuation discount implies that shares of Kinder Morgan are 40% to 50% undervalued compared to its peer group's. Two factors had weighed on Kinder Morgan's stock in recent years: its balance sheet and uncertain growth prospects. However, the company has unveiled a series of moves to address both issues. One of the tipping points for Kinder Morgan came in late 2015 when its leverage ratio rose to a concerning level. Debt climbed to more than 5.8 times EBITDA, which put it on the brink of losing its crucial investment-grade credit rating. That forced the company to slash its dividend and redirect that cash toward capital expenses and debt reduction. The company also completed several joint ventures and asset sales to bring in money and funding for expansion projects. As a result, the leverage ratio stood at a much more comfortable 4.9 at the end of the second quarter. That ratio appears poised to improve further after Kinder Morgan announced the sale of its controversial Trans Mountain Pipeline and the associated expansion project to the Government of Canada. The company expects to receive about $2 billion in proceeds from the sale, which it plans to use to repay debt. The company believes that this move could win it a credit rating upgrade, pushing it further into investment-grade territory. In addition to improving its balance sheet, that transaction also clarifies the company's growth prospects. With the controversial Trans Mountain pipeline expansion no longer in the fold, Kinder Morgan now has $6.3 billion of capital projects under construction, which should drive double-digit earnings growth over the next couple of years as they enter service. Meanwhile, the company is making quick progress on another major project that it could add to the backlog later this year. With its balance sheet back on solid ground and visibility into future growth increasing, there's nothing left to hold Kinder Morgan's stock down. There don't appear to be any hindrances that could prevent the company from achieving its goal to increase its already attractive 4.45%-yielding dividend by another 25% in 2019 and 2020. That growth would boost the company's yield up to around 7% for investors who buy today. Despite all the turmoil in the oil market, Kinder Morgan's cash flow has barely budged off its peak. And even though the company has addressed investors' concerns, its shares remain significantly undervalued. At some point, the market is bound to realize that shares are just too cheap. 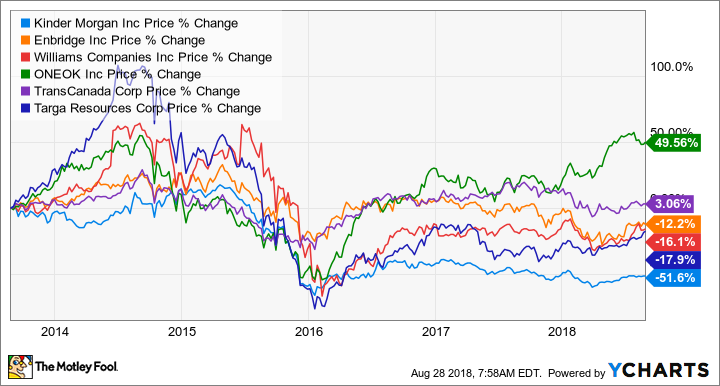 But in the meantime, value-seekers have a chance to pick up this top-tier pipeline stock at a fantastic price, which would set them up to potentially earn a windfall profit in the future.